7 hours after we returned to Japan (the journey from Australia to Japan is a whole other blog post for another day), our local VBS started and I spent all week taking photos of super cute children while they worshiped Jesus. It was AWESOME but exhausting! I'm so glad to relax for a few days...but only a few days. 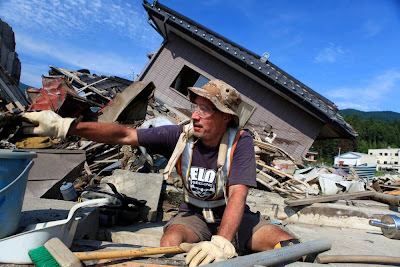 Then, next week, I'm heading to Ofunato, Japan to help All Hands with their tsunami clean up efforts. I stole this photo from their facebook page to show you what the area still looks like 5 months after the deadly tsunami swept through the town. Obviously there is still TONS & TONS of work to be done and I'm glad I am able to help out. I don't know how much internet access I'll have there, other than my iPhone, so I probably won't post again until the end of the month. glad your vacation went well. So excited for your volunteer work.